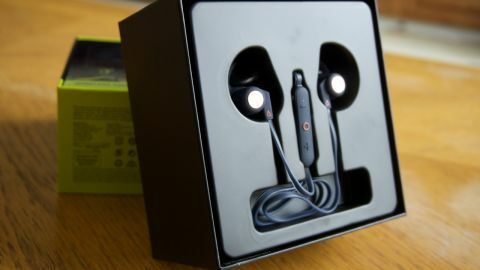 The Outlier Sports headphones might not be the best for home listening but, considering these only cost $69 (£59, around AU$90), there should still be room in the budget to buy a pair of over-ears for when you get home. About two inches away from the left earbud you’ll find the in-line remote. The remote offers your standard playback controls, plus a built-in microphone and a hidden microUSB port that can be sealed with a rubber flap when not in use. As for the earbuds themselves, they’re a bit wider but they aren’t prone to falling out thanks to the included wingtip. Creative ships every pair of earbuds with three sets of eartips of varying sizes and two replacement wingtips in case something happens to the standard set. The medium eartips and single wingtip come standard out of the box, and we found them to be the most comfortable for long listening sessions and provided the best passive noise-cancellation out of the pack. We found we could wear them for about two hours at a time without needing to take them out, and were very comfortable to wear throughout our regular one-hour workout sessions. One last thing to point out: These headphones are IPX4 rated. That means they’re sweat-resistant, but not totally waterproof. If you’re looking to take something with you near the pool, you’re going to need to look elsewhere. The Creative Outlier Sports are slightly more style than they are substance, at least when it comes to audio reproduction. We found that while the Outlier Sports had enough clarity to get us through our workouts, it wasn’t the best pair of earbuds to wear around the house. But while clarity was a consistent issue, there was still a lot to appreciate about the overall performance. First off, mids and highs came through exceptionally well. While using the headphones to listen to YouTube TV, dialogue came through crisp and clear, and listening to songs like Tessellate by Alt-J, cymbals crashed emphatically while the soaring guitar part kept our toes tapping. Unfortunately, however, there’s not a ton of weighty bass here – if you want that, you might want to consider the more expensive Beats X or Powerbeats, or for a more robust all-around sound, shell out for the RHA T10i or Klipsch X6i. While the lackluster clarity and lack of bass don’t make them an excellent pair of earbuds for longer listening sessions, the Outlier Sports are plenty powerful to overcome the dull hum and sometimes loud crashes in the weight room – something we can’t say about every pair of wireless in-ears. Also, for a pair of in-ear headphones, they have a decent sound stage. You’ll never be convinced that you’re at a live performance while wearing them, but the sound feels slightly more spacious here than it does on other in-ears. That being said, our favorite aspect of the headphones was the battery life. Creative rates the Outlier Sports battery life at 11 hours and, from our testing, that seems about accurate. That means you’ll be able to take them to the gym five days a week without needing to juice them up and then, come rest day, plug them in to get them ready for the next workout. Overall, the Outlier Sports are a great sports headphone. They’re lightweight, feel secure in the ear and can pump out the jams for hours on end. They might not be the best for home listening but, considering these only cost $69 (£59, around AU$90), there should still be room in the budget to buy a pair of over-ears for when you get home.